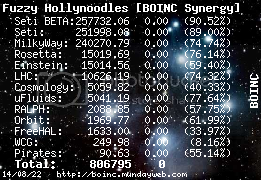 We fixed something in the interaction of Rosetta with BOINC to trigger more informative debugging messages upon crashes. Please continue to post what goes wrong! Message 1815 - Posted: 11 Jun 2006, 11:18:05 UTC - in response to Message 1807. Looks like it \'went down\' sometime late friday. Maybe when they re-started the Rosetta server after the boinc upgrade they forgot to check on poor old second-cousin Ralphie! Message 1819 - Posted: 11 Jun 2006, 22:37:37 UTC - in response to Message 1818. It was a database problem, and the database guy on our team was unavailable. Ralph\'s back! Not sure if this is a bug or not, but in the graphics for this WU, the protein simply isn\'t there, though everything else appears to be running properly. Also, I\'m sure this has been mentioned (haven\'t been around much lately), but with most of the WU graphics, when opened a second (and then third, etc) time, the information at the bottom is shifted down so that the bottom line (the project URL & Accepted Energy) is not visible. Other than that, everything looks good so far. 1)I don\'t know if this was not mentioned early, but the progres counting don\'t work well. Sadir: the percentage complete thing is perfectly normal, the first model just took that long. no errors with 5.23 so far here, couple of successfull WUs finished. I have a funny (interesting) one. One my laptop (which has been pretty much flawless at Ralph, as opposed to my AMD64 3700 sandiego which experiences the \"fatal windows\" error) I\'ve seen something happen twice in 24 hours. I see either the Rosetta 5.22 screensaver or the Ralph 5.23 screensaver will show on my window when I return from some personal task. the graphic will NOT go away by moving a mouse or pressing a key. I had another window open but couldn\'t see it. The mouse would still work on the unseen graphic if I just clicked all over I could hear it interacting, but the Rosetta Graphic would not release my screen. I ended up pressing the power button on both occasions, only to see the HD activity light blink and hear the windows log off Wav, but the Rosetta graphic was still on the screen all the way to Shutdown when the screen when dead. Since mine is the only report of this, it was on both Rosetta and Ralph, and hasn\'t happened with the laptop before, I will be doing some adware/malware/virus/others scans to see if the problem is on my end. Strange error in FRA_t316_CASP7_hom001_1_IGNORE_THE_RESTt316_1_PROTINFO-AB_TS1.pdb_666_2_0 . This application has requested the Runtime to terminate it in unusual way. Please contact the application\'s support team for more information.\"
After this WU was finished (with error), Simap stopped to make errors and finished next WU successfully. Rom had mentioned there might be a fix to the fatal windows errors in 5.23. When it was released, I set the box I usually got these errors with to NNW/NNT for all other projects and suspended them, so I\'d run nothing but 5.23. I\'m not ready to say \"it\'s Fixed\", but so far it sure looks good. Message 1830 - Posted: 16 Jun 2006, 14:49:02 UTC - in response to Message 1829. Message 1831 - Posted: 16 Jun 2006, 14:51:23 UTC - in response to Message 1829.
the progress indicator isn\'t linear. What you\'ll see are jumps in percetage. All WUs start at 1% and slowly proceed higher until one model is done. Then it jumps to another percentage and the points to the right of the decimal slowly proceed again until the next model is done. I.E you might see this if you checked the status every 10 min: 1.000, 1.0001, 1.0002, 1.003, 12.000, 12.001, 12.002, 12.003, 24.000, 24.001 etc etc until the time runs out where it jumps to 100%, uploads and reports. The number of models depends on protein size, and puter speeds (for the most part). Every WU will run atleast ONE model regardless of time (except where terminated by \"watchdog timer\"). Message 1832 - Posted: 16 Jun 2006, 14:56:26 UTC - in response to Message 1831.
is the results of it. Message 1833 - Posted: 16 Jun 2006, 15:29:22 UTC - in response to Message 1832. This is normal, it just means the wu completed successfully and didn\'t need the watchdog, so it shut it down. if the protein is huge, your puter old, or your runtime is set low, then this is what you should be seeing with your future wus. It\'s helping. Message 1834 - Posted: 17 Jun 2006, 11:00:00 UTC - in response to Message 1828. Message 1835 - Posted: 17 Jun 2006, 20:10:13 UTC - in response to Message 1821. Jobs are finishing OK, w/o any errors, in normal run time ! Message 1836 - Posted: 17 Jun 2006, 22:20:50 UTC - in response to Message 1835. I think Ralph needs to work on the Progress bar area of the program. I went thur no problems, It was the first time I saw that from this project is all. so I thought I would say something but if that is normal then nothing to worry about.